Italian Chicken and Spinach Casserole (Paleo, Keto friendly).A Meal Prep Recipe Using 5 Ingredients. Diced canned tomatoes or a diced tomato pasta sauce. Drain excess tomato juice before using. (If using canned tomatoes, buy Italian and herb flavor). Preheat oven to 350 F and oil your casserole dish/meal prep container. If meal prepping without baking, skip preheat. Toss your chicken in sour cream or mayo. Mix in garlic powder and italian seasoning. Set aside. next Layer your zucchini and spinach at the bottom of the casserole. Save extra for topping. Place your chicken mix on top of the spinach and chicken. Last, spoon your tomato mix on top of the chicken. Add any extra zucchini or spinach on top. Be sure the tomatoes and zucchini are not too watery otherwise the dish will accumulate water when baking. Oven safe meal prep casserole dish I use. 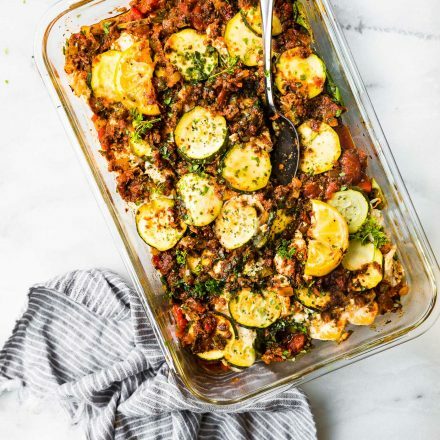 TO AVOID EXCESS WATER in casserole – You can also lightly bake your zucchini slices in oven at 400 for 10 minutes before adding them to the casserole. This will remove water.